This might be the digital age, but in today’s contemporary art world, there are still flourishing photographers who prefer to shoot film for various reasons. 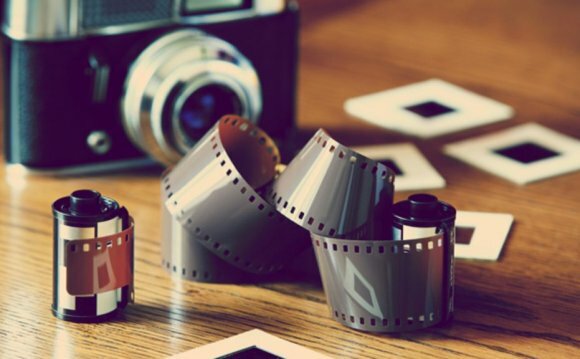 Of course, most of them love the quality of images and the meditative process of the various formats; film as a medium can teach a photographer a lot to inform their work with. Actual name Vladimir Milivojevich, this photographer shoots almost exclusively in black and white film and fixates mostly on unusual and dangerous street scenes of dangerous New York Neighborhoods, gang life and skinheads and violent protests in his home town of Belgrade Serbia. This photojournalistic style is given a dark edge, devoid of distracting colors. Boogie has been featured in various major magazines including New York Times, Time magazine, Huffington Post, Huck magazine, and an HBO showcalled “How To Make it in America”. He has also published 5 monograph books andtaken part in various gallery exhibitions in Paris, Milan, New York and California. His clients include Nike, Puma and the New York Yankees. Richard Mosse is another photographer who utilizes the art of film in a creative and meaningful way. The film he chooses to use in most of his works - Kodak AeroChrome - has been discontinued. We have previously interviewed him about his AeroChrome series in Congo which is a beautiful contradiction of a war-riddled countryside depicted in unusually bright magenta hues. The resulting landscapes are beautifully haunting and pleasantly surreal. What is most interesting and striking about this work is how the use of medium brings out the feelings of unease and unrest that this locality is going through. Instead of showing blatantly violent or depressing scenes, the artist instead puts himself in an uncomfortable situation by choosing a film that is new to him and provides such weird affects, and in turn instills his work with the same kind of aura to awaken these emotions in the audience. Be sure to check out our exclusive interview with Richard Mosse, and find out what it’s like to trek film through the Congo. Amanda is well known for her big collection of celebrity portraits, living as she is near Hollywood, but what interests me more is her series of haunting night landscapes that she has shot using medium and large formal film and no digital manipulation or affects. She says she loves using film for these low light long exposures as she simply can’t get the same kind of quality and exposure latitudes with digital. She can get better blacks and great quality even at ISO 800, and so we can see in her many long exposures. The lights and darks are just perfectly captures, and the whole scene has the feel of a UFO invasion in the process. There is always a strong light source in her photos that gives her night landscapes a staged yet haunting feel that is just simply beautiful. Watson is an Irish photographer who mainly works with portraiture, interiors, and travel photography. A lot of his work is commercial and he has published in various magazines. However, his series which encapsulates the interiors of houses in New Orleans after Hurricane Katrina and interiors of the Auschwitz concentration camp shows his fine art side and is quite powerful. He reflects on how he questions whether he is invading the privacy of the victims, and notices how their presence in these spaces is still felt. He says he loves to shoot his work in film because it is so simple and easy to use, and so much more beautiful and sophisticated than digital. Jeff Lipsky is a commercial photographer working and living in Santa Monica. His clients include various huge magazines such as Vogue and Outside magazine and he has countless celebrity portraits in his collection. Jeff finds film to be beautiful and states many reasons for choosing to shoot with it. His favorite is 4x5” format for portraits and he feels digital takes away a lot of the pace and feel of sheet film. Film is more forgiving and he feels you can capture more detail in most lighting situations, details which digital cannot yet match. Todd Hido is most well-known for his haunting series of various houses in the night. These photographs are eerily devoid of any human presence, and yet the bright lights within the houses have a feeling of spying or encroaching on someone’s property. Hido likes to drive around, house hunt, and react to different lights, at times preferring to shoot directly into the sun or street lights. This gloomy night time scenes have a very dark painterly feel to them. He says he shoots like a documentarian with the natural light available, but in the darkroom he is more like painter, slowly taking his photos to where they end up. Hido has been part of various exhibitions both solo and group, and has been featured in countless museum collections including the Guggenheim in New York.